If you want to buy something today, you can often do from your couch. Pop open your computer or grab your smartphone and you are instantaneously connected to the world of online commerce. With Amazon leading the way, there’s often someone out there selling whatever you’d need. The convenience of shopping at home isn’t new, though; before the Internet, there were (and still are) mail-order catalogs. Retailers sent thick booklets to your house which contained all sorts of items for sale — clothing, furniture, home accouterments, even food. And among the many retail-by-mail companies was one stand-out — Sears. Throughout most of the 20th century, Sears was America’s largest retailer, and its incredible mail-order catalogs were a prime driver of its success. Via Sears, you could buy almost anything you wanted from the comfort of your own home. You could even order a new one if you wanted — a new home, that is. By mail. It wasn’t Sears’ original intent to sell mail-order houses — it was the product of excess inventory. Sears got its start at in 1886 when its founder, Richard Warren Sears, started a mail-order watch business. It expanded over the next two decades, experimenting with all sorts of different verticals. One of the less-successful initiatives was their effort to sell building materials via the mail — the demand for pre-cut plywood and the like wasn’t as high as Sears would have liked. As a result, they had a lot of unsold stuff laying around. The category manager came up with an idea — bundle all of this stuff up into DIY building kits. In 1908, “Sears Modern Homes” was born. Via this niche catalog, consumers could literally buy a house to be delivered to them by rail. The house wouldn’t arrive in liveable condition, though; you’d get about 30,000 parts weighing approximately 25 tons, along with detailed plans on how to piece them together into something which resembled four walls and a roof. There were 44 models to choose from, ranging in price from $360 to $2,890 (or about $10,000 to $100k in today’s dollars, accounting for inflation) and the company estimated that a person of average building skills could put it together in three months time. Ridiculous? As it turned out, no. People actually bought them and built them — many people, in fact. 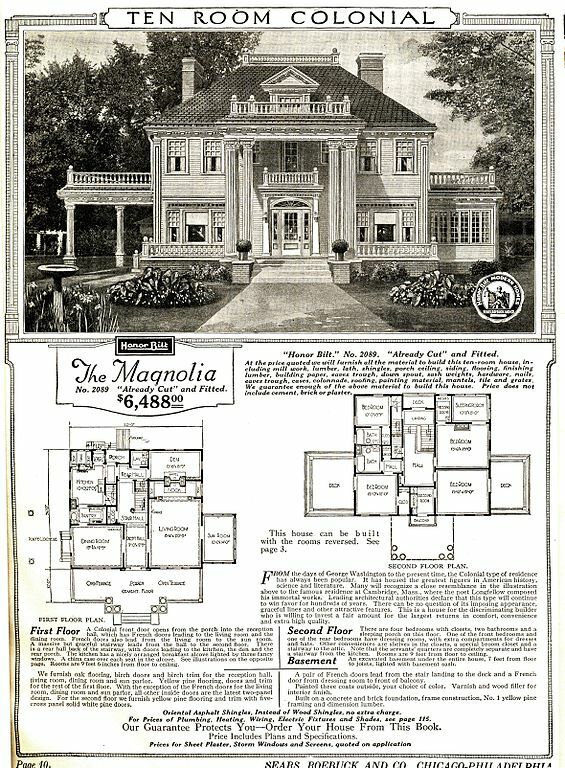 Here’s an image from one of the catalogs (in later years) advertising the “Magnolia” model, often considered one of the fancier models; right below that, you’ll see a picture of the Magnolia in the wild, freestanding in a small North Carolina town. The Sears Modern Homes catalog wasn’t a small blip in the company’s history, either. As plumbing, HVAC, and electricity became increasingly common, the catalog offered premium packages which included the ability to avail oneself of such comforts for an additional fee. And to make these homes more affordable to those who couldn’t send hundreds if not thousands of dollars through the mail, starting in 1912, Sears began to offer financing, effectively offering as a mortgage lender. In total, according to 99 Percent Invisible, Sears sold more than 75,000 homemade home kits — assuming families of four, that’s enough housing for more than a quarter-million people. For a generation or two, Sears was opening the door to homeownership. Ultimately, though, the greater economy and geopolitical scene did Sears Modern Homes in. When the Great Depression hit in 1929, many of those who financed their homes found themselves unable to pay their debts; Sears ended up taking a massive loss as a result; after 1934, they stopped offering to finance. In 1940, with America’s entry into World War II on the horizon, they ceased printing the Modern Homes catalog entirely. Sears, to its credit, hasn’t let this bit of its history go to the wayside. 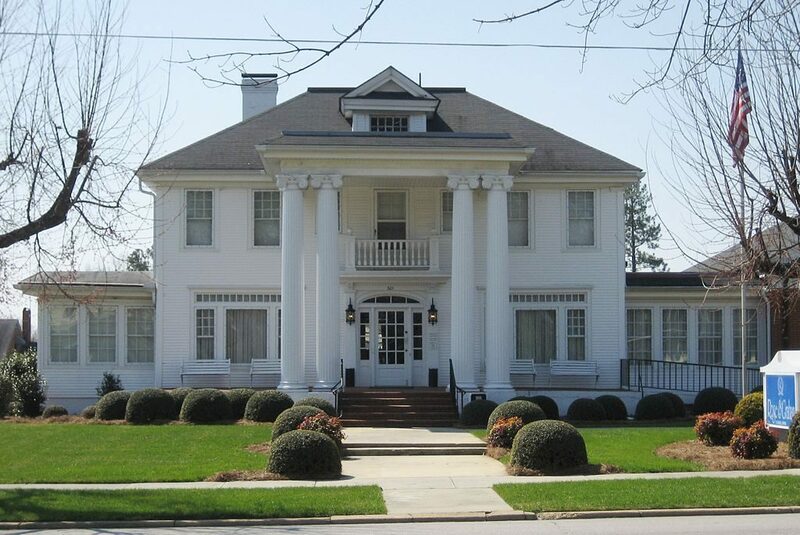 The company maintains an online archive of old catalogs including the pages offering homes for sale; here’s a link to the first homes, from 1908 to 1914. Unfortunately, the company did not retain a list where these homes were actually built. But if you want to see one in the wild, there’s a blog for that — for the last few years, a couple which owns a Sears house has been cataloging (sorry!) ones they’ve discovered, here. And if you want to check your own home to see if it came from a Sears kit, there’s a website for that, too. Bonus fact: Financing for their mail-order home business wasn’t Sears’ only foray into the money-lending space — and certainly not the longest lasting. In the 1980s, the company purchased a brokerage firm (Dean Witter) and a real estate franchise (Coldwell Banker), creating “Sears Financial Services” in the process. To round out their offerings, Sears also introduced a credit card: the Discover card. While it never reached the popularity of American Express, Visa, or Mastercard, Discover became a success regardless. From the Archives: Proto-TP: Another use for the Sears catalog.